For the last half a century, the market for stage vocal mics has been dominated by moving–coil dynamic designs, and with good reason. Classics like the Shure SM58 are robust and affordable, with tight cardioid polar patterns for feedback rejection, and a tonality tailored to cut through the worst on–stage mud. 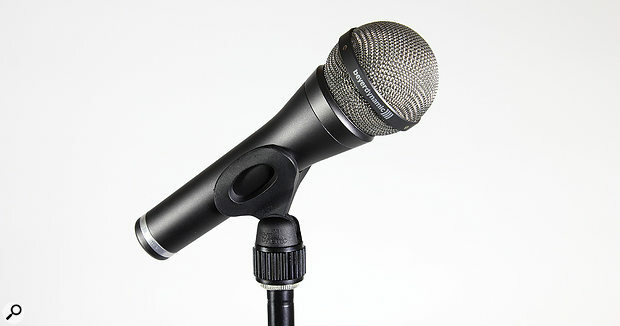 In the last decade or so, capacitor mics such as the Neumann KSM104 have made inroads into the upper end of this market, perhaps in response to the increased clarity and bandwidth of modern PA systems. However, there is also a third way. After many years’ sterling service, the M500 entered a well–earned retirement a few years ago, but Beyer have drawn heavily on its design to create the new TG V90r. This junior member of the Beyer ribbon family is unusual in several ways, not least because it is said to offer a true cardioid polar pattern — other unidirectional ribbon mics typically have something closer to a hypercardioid pickup. In fact, whereas many cardioid mics tend towards hypercardioid behaviour at high frequencies, the TG V90r’s polar plot ‘blooms’ in a slightly more complex way above 2kHz, with a pair of lobes appearing between 120 and 150 degrees off–axis depending on frequency. Each TG V90r comes with its own frequency response chart, and the one supplied with the review model closely matched the ‘typical’ chart given in the specifications. Notable features of this plot include a smooth bass roll–off, beginning around 300Hz and reaching –18dB at 50Hz — which is surprising until you realise that a measurement distance of 1 metre is specified, and the mic will typically be used much closer than this! The measured response is ruler–flat from 300Hz to 2kHz, rising to double peaks at 4kHz and 10kHz before droppping away steeply above 13kHz or so. The TG V90r is a passive design, and sensitivity is specified as 0.9mV/Pa: roughly 6dB less than the SM58, and considerably less than Beyer’s own moving–coil vocal mics such as the M69 TG. In place of the more usual pencil–case–style pouch, the TG V90r and its matching clip are supplied in a cylindrical container made of clear plastic, which unscrews in the middle. It’s unusual and eye–catching, but given the cost of the mic, it’s also rather cheap–looking, and not ideal for long–term storage. As supplied, the clip would not hold the weight of the mic without drooping, but a turn with a screwdriver sorted this out and I had no further problems. Physically, the TG V90r follows the form factor of mics like the SM58, with a roughly spherical head mounted on a tapering metal body, which is finished in a smart semi–matte grey. However, at almost 6cm in diameter, the head is quite a bit larger than that of the SM58 or indeed most other stage mics I know of. This attracted several comments from performers, and I suppose it might be an issue in contexts where the singer needs to be photographed or seen clearly. To give the TG V90r a thorough workout on lots of different voices, I took it along to a multi–performer acoustic night and substituted it for one of the venue’s usual SM58s. Two things quickly became apparent. One was that as long as the singer stays a little off the mic, the TG V90r sounds great. Even through a fairly modest PA, the sound was articulate and balanced, with the mic’s presence boost aiding detail and clarity rather than adding harshness. The other was that not all of the singers at multi–performer acoustic nights stay a little off the mic. There is a breed of vocalist that isn’t comfortable on stage unless their tonsils are grazing the headbasket, and the TG V90r clearly didn’t enjoy being treated like this. Used from a distance of six inches or so, the sound is smooth and focused, standing out in the mix without the aggressive quality that you get from an SM58. Used from a distance of 1 nanometer, however, it was much more susceptible than an SM58 to sibilance and plosive pops, and the lower mid range acquired an unappealing thickness. There were also one or two singers who put much more than six inches between themselves and the mic, but the TG V90r dealt with this kind of misuse much more gracefully. An SM58 quickly becomes intolerably thin when you move away from it, but with this mic, the sound retained body and substance to a considerably greater distance. Despite its low sensitivity, I never quite ran out of preamp gain even in these circumstances, and impressively, the TG V90r never even hinted at feeding back, even when other mics on the same stage were threatening to do so. At its list price, however, the TG V90r is not really competing head–on with the SM58s of this world. This isn’t a mic that venues and hire companies are going to be buying in bulk, using for a couple of years and then throwing away. Nor is it targeted at novice singers and inexperienced amateurs. Rather, it’s a mic that serious vocalists who really care about their on–stage sound will be choosing as a long–term investment. And if you’re in that position, the TG V90r is an option you have to try out. It is a very promising alternative not only to high–end moving–coil mics, but to capacitor mics too; and if you never expected to use a ribbon mic on stage, prepare to be surprised! Half a century ago, live performers might have encountered unidirectional ribbon mics from the likes of Reslo and Shure, but as far as I know, the TG V90r is currently the only such microphone on the market. Can sound wonderful when used well. Seems very robust and well built. Not as forgiving of bad mic technique as some alternatives. 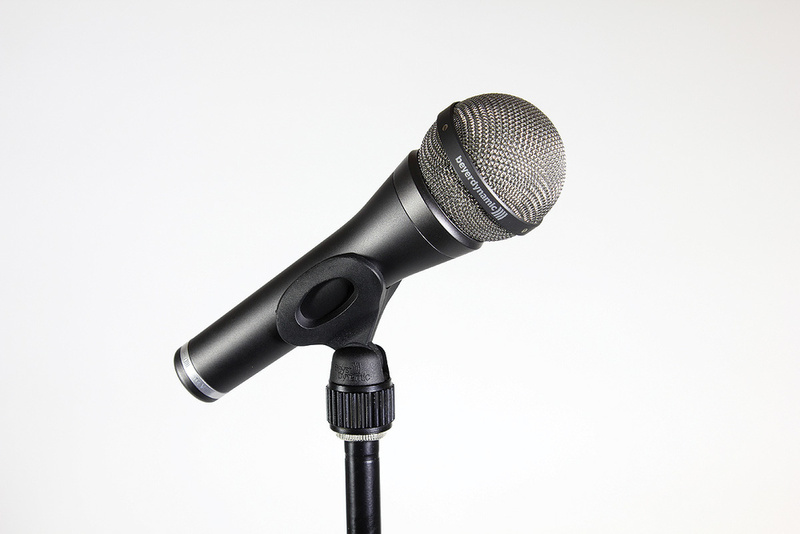 Physically larger and less sensitive than most moving–coil mics. A better case would be welcome. Drawing on more than 50 years’ expertise in designing ribbon mics for stage use, Beyerdynamic’s TG V90r makes a fine alternative to high–end moving–coil and capacitor models.